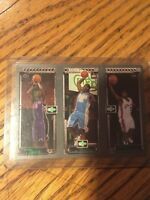 Tim Duncan Spurs 1997 Topps Finest #101 Rookie Card rC PSA 10 Gem Mint Quantity! Tim Duncan is rather under-appreciated in the "hobby", but his career stats and accomplishments speak for themselves. He is a certain "first-ballot" Naismith Basketball Hall Of Fame inductee. His Topps Finest rookie card is very inexpensive at current prices, even in a high PSA grade. Every collection should have one of these.... or the even more desirable refractor version is you can afford it !!! Great card of an ABSOLUTE LEGEND! On and off the Court Duncan was a perfect role model and player! A sure-fire first-ballot hall-of-famer and 5 time world champion! Learning from the great David Robinson early in his career Duncan molded himself into arguably the best forward in the game! One of the toughest and best all-around players and teammates in basketball history! Duncan will go down in San Antonio as possibly the greatest player to have ever played for the franchise! Statues and a first-ballot Hall of Fame await, as sure as the sun will rise! Very well-made card! 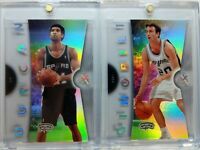 Must have for a true Spurs fan or any fan seller or collector! RARE!!!! !